"Any little distraction will kill you." Voltage Pictures has debuted another new trailer for the movie Life on the Line, an action-thriller about the risky lives of power line workers. The film stars John Travolta and Devon Sawa as two line workers who end up working during a massive storm that nearly destroys their lives. The cast includes Kate Bosworth, Sharon Stone, Gil Bellows, Julie Benz and Ryan Robbins. We featured a trailer for this earlier in the year, as it looks unlike anything else being released nowadays. It seems obliviously cheesy, but also almost like a throwback to 90's action movies. Tavolta looks pretty wild, though I'm not sure if this will be any good. The release date listed in the trailer is for Singapore, not the US. 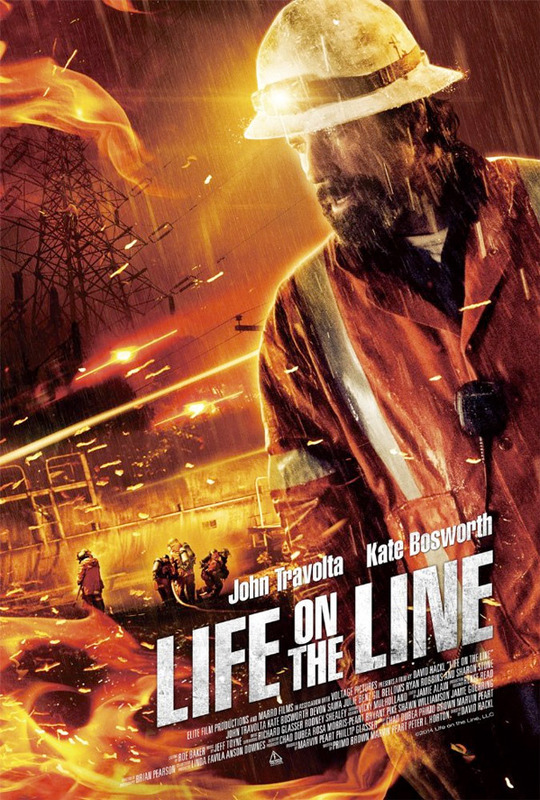 Life on the Line follows the lives of a crew of eccentric and courageous power line workers who do the extremely dangerous work of fixing the crumbling electrical grid. John Travolta stars as Beau, a salt of the earth man who blames himself for his brother's death and raises Bailey, his orphaned niece (Kate Bosworth). His worlds collide when Bailey's handsome lover (Devon Sawa) joins his linemen crew on the eve of a massive and deadly storm that threatens to rip their lives apart. Life on the Line is directed by former production designer David Hackl, of the films Saw V and Into the Grizzly Maze previously. Voltage Pictures seems to be releasing this movie sometime in 2016, though we're still not sure of any exact date yet. I'm pretty amped for this high voltage drama. I heard it's quite shocking, but is grounded in certain parts. Well....that will have me bolting to the theater. I am pretty "amped" for this one! Powerful combination of Benz, Stone and Bosworth...ZZZZZ. Fitting that they got TraVOLTa to do this LOL.